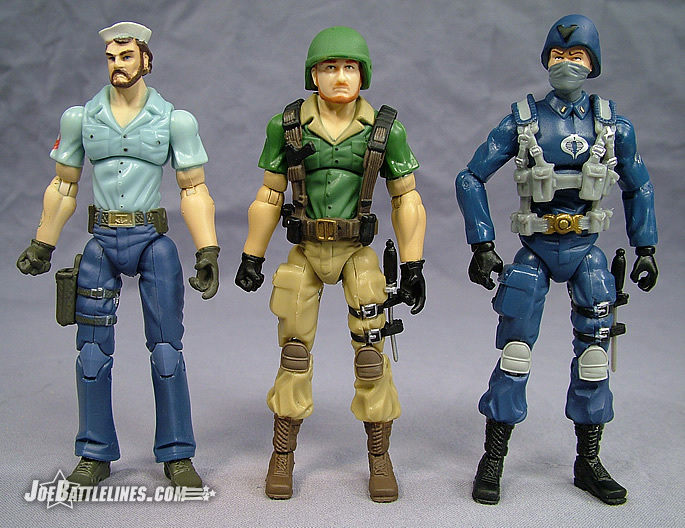 In the world of toy collecting, the GIJoe 25 th Anniversary line is a hot property. Featuring all-new sculpts and a new style of articulation, the popularity of the line caught Hasbro completely off guard and what was originally intended to be a pair of five packs quickly exploded into a full-fledged toy line. Figures hit the shelves in wave after wave and, in many cases, sold out just as soon as they hit the pegs. 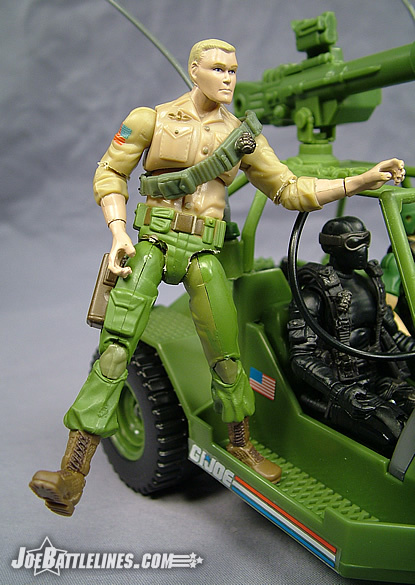 However, a key component of the original GIJoe: A Real American Hero toy line was the abundance of vehicles and accessories that took the play value of the figures and multiplied it by a factor of a thousand! Target, ever the retailer that supports GIJoe, took the lead and now three classic vehicles are getting a face lift and are being released in this anniversary line. 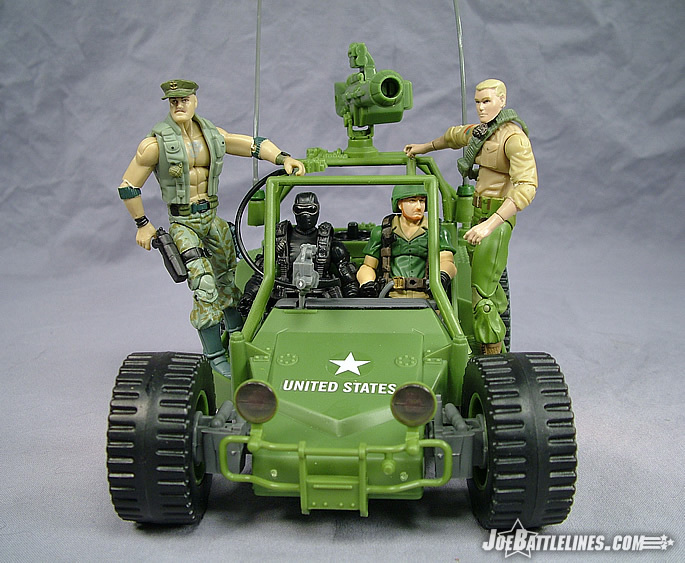 While I would have preferred to see the VAMP hitting shelves now, it seems fitting that the Joe team’s other “go to” vehicle would see re-release in this line. 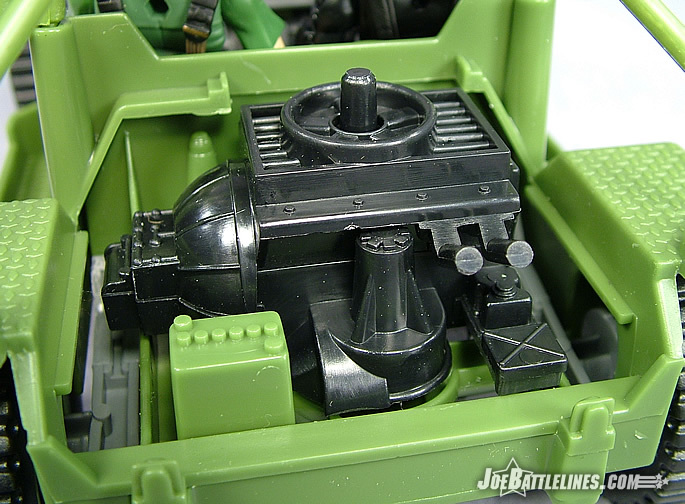 That’s right Joe fans, I’m talking about the AWE Striker with Crankcase! When it comes to the anniversary line, Hasbro is trying to get as many miles as possible out of every existing tool produced. As a result, several figures have seen as many if not more repaints in this new line than the characters saw releases in other original toy line. Thankfully when it comes to Crankcase the folks in Pawtucket are starting to mix and match parts a bit more. The recipe to produce one anniversary AWE Striker driver calls for Shipwreck’s arms, upper torso, waist/lower torso and the legs of the Cobra Trooper/Officer. Add in the ENORMOUS head of Breaker and you’ve managed to resurrect Crankcase from toy obscurity to sought-after retail exclusive. For the most part, the combination of pieces works fairly well to recreate the characters signature look. Shipwreck’s shirt is painted a dark green save for the collar which is painted tan. The figure’s pants are also painted in the same tan hue with the kneepads and boots being rendered in a darker shade of brown. 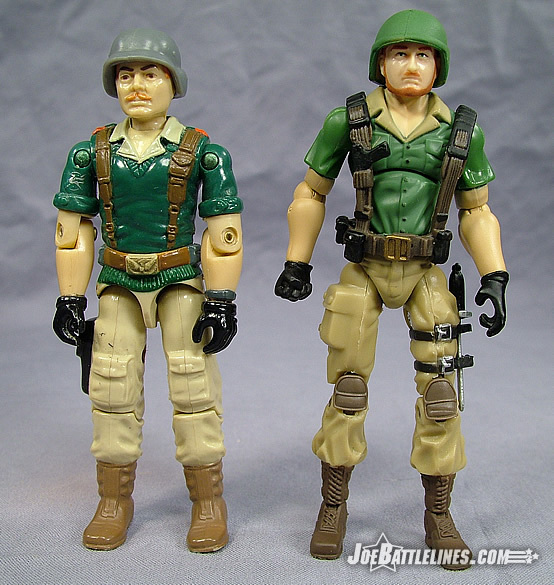 The web harness that saw release with the Cobra Troopers is remolded in brown with some black highlights and the helmet is molded from tan plastic and painted the same green as the figure’s shirt. 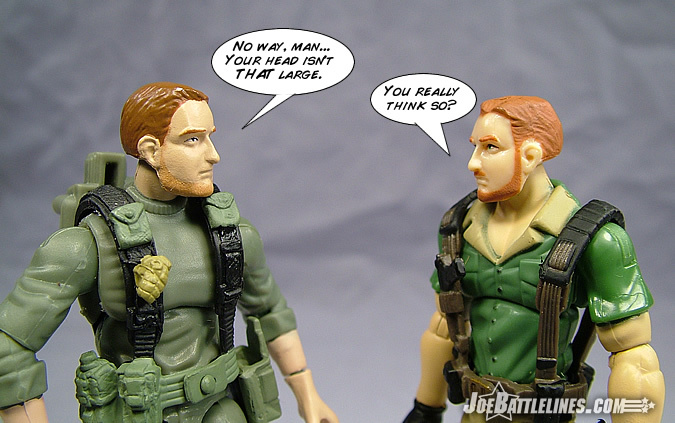 (Why in the name of Ice Cream Soldier is Hasbro insisting on painting some of these helmets instead of molding them in plastic of the desired color?) This combination, while not 100% accurate to the original figure, really is similar enough that the figure is instantly recognizable as “that guy who drove the AWE Striker”. I’m not crazy about the use of the Shipwreck arms and their Popeye-esque musculature but for an included driver I’m willing to let it slide. I will say that Hasbro did find one way to make the “Mentok the Destroyer” head a bit more palatable by molding it in flesh tone plastic rather than slapping a coat of paint over the figure’s noggin. In the end this is a decent way to bring a character into the 25A line that otherwise might never have seen re-release. Any thoughts on this latest addition to the “no-ring” family, Justin? The first few times I saw Crankcase, I wasn’t really sold on the parts combination or the overall look of the figure, but I have to say my opinion has changed pretty drastically. I know there’s a lot of hate out there for Shipwreck’s arms, especially the permanently closed fist, but it doesn’t bug me a heck of a lot. Don’t get me wrong, I would have much preferred a swappable hand, one with a fist, and one with a normal grip, but I don’t mind the fist too much either, even if it doesn’t make a whole lot of sense for someone who is driving a car most of the time. Unlike a lot of folks I really like the musculature of the arms here and I think it makes the figure stand out nicely. The Breaker head originally was a deal breaker when I saw it in picture form, but having the figure in hand, I couldn’t be happier. 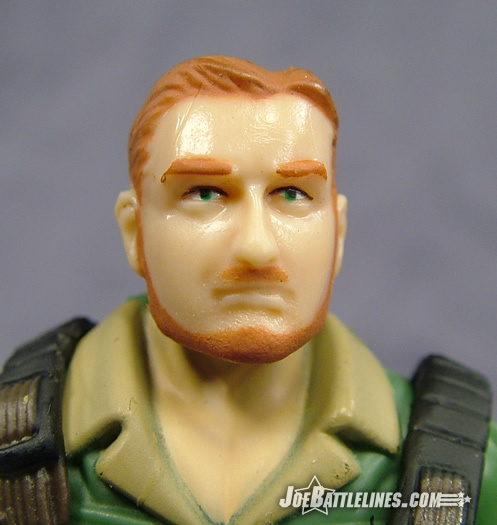 Hasbro really salvaged what was a pretty awful looking head sculpt and made it a lot more bearable. They elected to give Crankcase a full beard instead of just the moustache, but it works fairly well in all honesty. 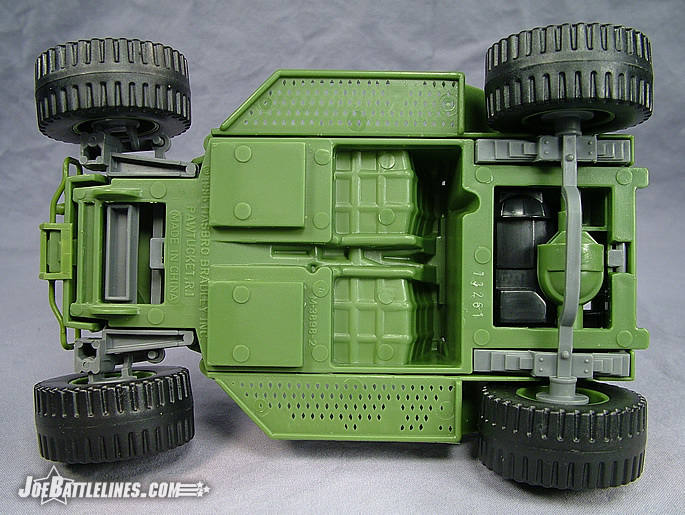 Even using all existing parts, the Hasbro design team did a fantastic job bringing us a fairly accurate Crankcase. It’s not nearly 100%, but it definitely bares a close resemblance to the classic character, and someone as obscure as Crankcase is, I don’t think too many fans can get bent out of shape about it. Overall the colors and the parts choices gives us a pretty darn close look and a neat driver for the AWE Striker. 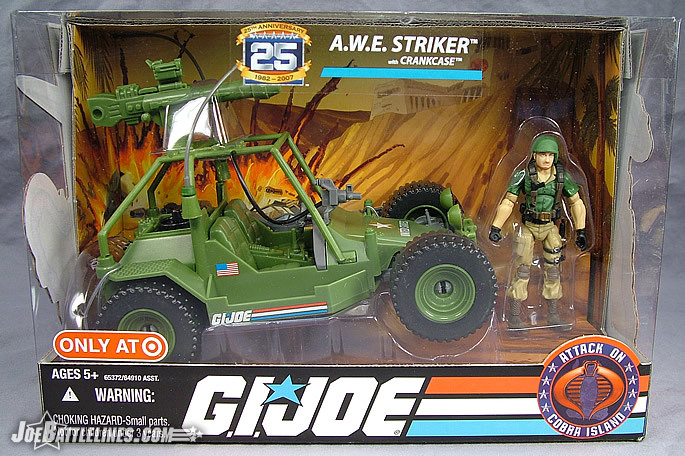 It’s time for another one of those “true confessions” moments: I never owned an AWE Striker as a young Joe fan. 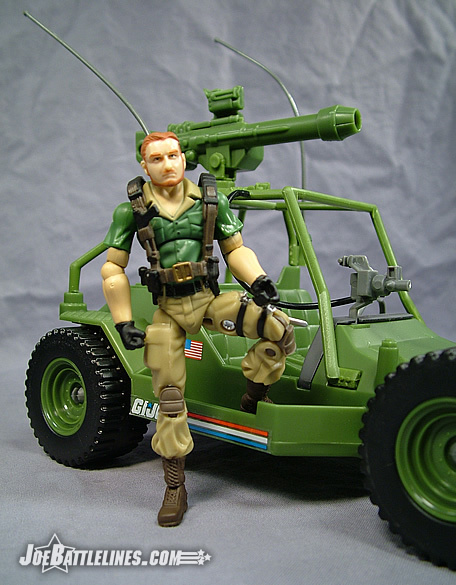 I was one of those kids who started buying Joes when they debuted in 1982 and wasn’t crazy about seeing some of my favorite vehicles and figures replaced by newer models—especially in the Sunbow animated series where older characters/vehicles just tended to disappear when a new model came out. As such, I didn’t see the logic in replacing a hi-tech jeep with an over-powered dune buggy. In the intervening years I’ve managed to acquire several vintage and re-released versions of this vehicle but I’ve never formed the long-lasting attachment to the design that many fans seem to have. That being said, for the price this is one heck of a re-release. Essentially unchanged from the original releases, the AWE Striker is back in a bright olive hue with the familiar gray suspension and steering wheel. 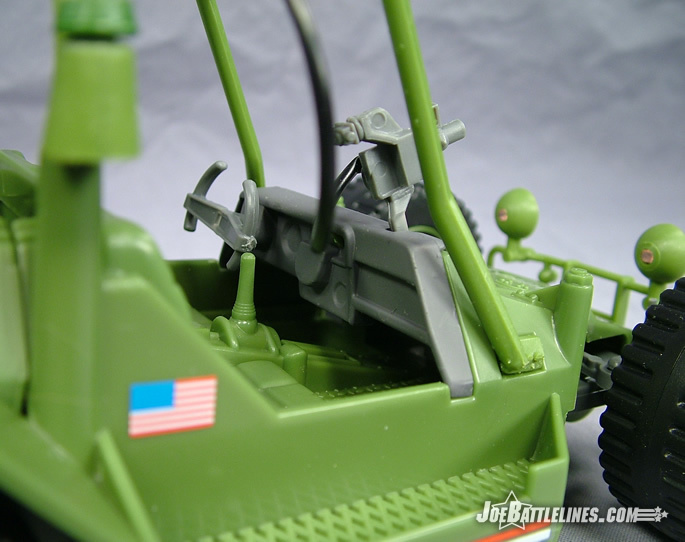 Some changes in color have been made as the seats on mine as well as the TOW launcher and now molded in the same green as the body in contrast to the dark gray tone of the original. It’s also a bit odd to buy a classic vehicle like this from a retailer fully assembled. 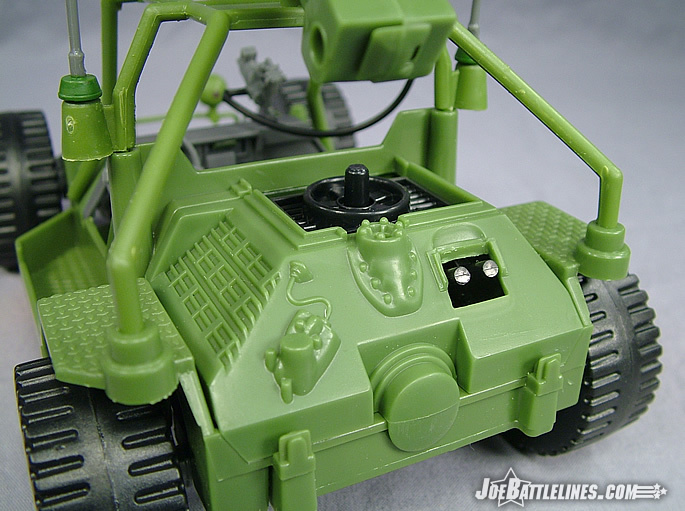 Part of the fun of buying Joe vehicles as a kid was the fact that they were almost a fun hybrid of model kit and toy. Possibly as a side effect of this vehicle coming pre-assembled, I’ve had some difficulty in trying to remove the engine block. The engine cover comes off with a little work but the engine itself seems to be firmly “stuck in there”. It’s also interesting to note that “out of the box”, the AWE Striker only has the decals pre-applied on one side. (Apparently the folks in the factory take the concept of “out of sight, out of mind” seriously.) Thankfully the vehicle is packaged with a decal sheet and a set of instructions so that fans can finalize the deco scheme of the vehicle to more closely resemble the original. I wouldn’t call myself a fan of the AWE Striker but even I find it hard to argue with the rugged nature of the design and the fairly faithful reproduction of the original. Good work, Hasbro! So, if Justin’s not too busy playing with Crankcase I’ll pass the keyboard over for his thoughts on this latest re-release of the AWE Striker. Unlike Fred (who must be a Communist if he never owned an AWE Striker) I currently own about half a dozen different iterations of the AWE Striker, and each of the different one has their interesting quirks. 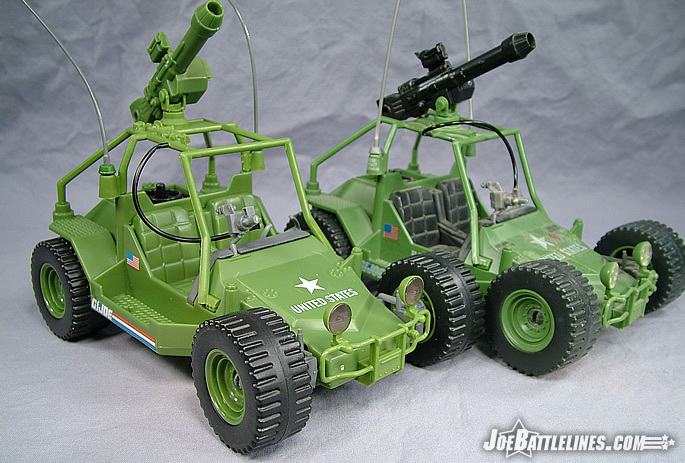 This version of the venerable Joe dune buggy is obviously based on the original and most famous version, and it replicates it very well. While the VAMP is definitely a more classic G.I. 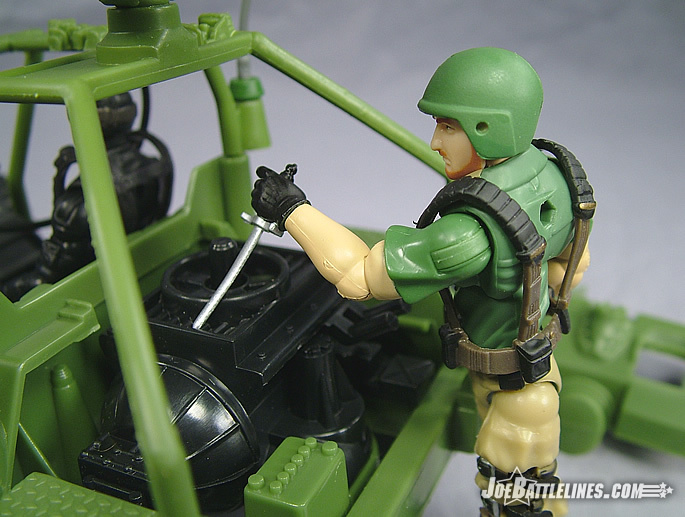 Joe vehicle, I’ve always preferred the speedy, high-powered AWE Striker, as it has a lot more intricate detail, a lot more play value, and some pretty crazy state-of-the-art weaponry. Another very cool touch with the AWE Striker here is that the running boards have been retooled with smaller footpegs so that the Anniversary figures fit on them seamlessly. While that may be a bit annoying to vintage fans hoping to replace their rattly old classics, it makes a world of difference to fans of the current Anniversary offerings who want Gung Ho and Roadblock riding “shotgun” so to speak. The removable engine cover, the large top-mounted cannon, and the dash-mounted camera are all intact in this new version and translated perfectly. With a great assortment of stickers (many of which you can place yourself) this vehicle will instantly transport you back to a simpler time, which has become more and more important in the current political and world climate. I couldn’t help but stick Crankcase in the seat of his AWE and roll him around after cracking the vehicle out of that box. In fact, this is something that I think has gotten VERY under-stated with these Target releases. The boxes. They are simply incredible! A lot of fans were somewhat irked that we didn’t get the familiar closed box with box art format that was so indicative of the vintage vehicles, but I gotta tell you, these boxes are MONEY. The vehicle is prominently displayed in the front window and there is an amazing painted battle scene on the cardboard behind that immediately transports you into this “Battle of COBRA Island” that these sets are all a part of. 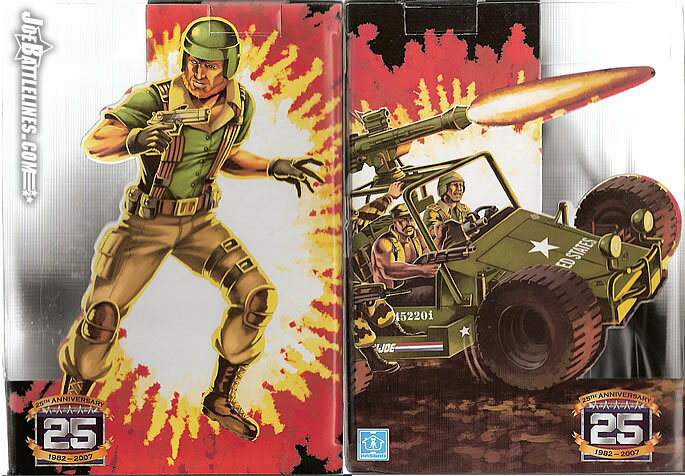 Not only that, but there is card art for the figure on one side, and boxart for the vehicle on the other. It really covers all bases. 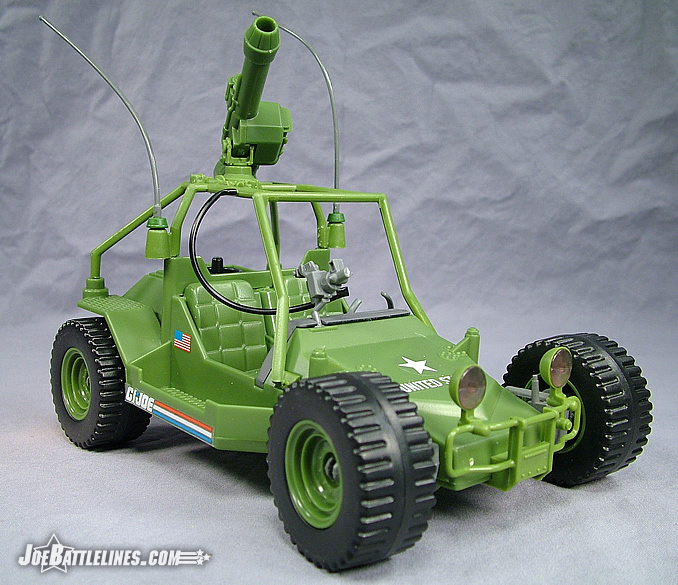 If you don’t own a vintage AWE Striker, this vehicle will satisfy your desires perfectly. Heck even if you own one already, this is an awesome compliment to it, and each one of these vehicles is a must buy, especially for the price. All-in-all this set is a STEAL for $9.99! Seriously, I paid more than a few years ago for a vintage AWE Striker at my local comic shop without the driver. This is also the first time since the original that the vehicle is back in green which is sure to strike a nostalgic cord with many fans. While I wish that the driver came with any kind of accessory besides his knife and I find the lack of figure stand a bit noticeable, I can’t disparage the sheer value of this set. Let’s face it, the price on the new single-carded figures are essentially $7.00 these days. (Thanks for jumping the gun, Wal-mart. “Always Low Prices” my aunt Betty!) To be able to buy a figure and a vehicle for just $3.00 more than I can buy a single-carded figure is one of those bargains that you just don’t pass up. I’d snag the Pile Driver with an included T’gin-Zu! My gut tells me that this is one exclusive that isn’t going to sit on shelves for long and that fans of this new style of figure are going to want to strike fast and snag these when they see them in stock. Heck, I like this set and as I stated earlier I’m not even a hug AWE Striker fan! This is just another solid release in a line that is getting closer and closer to winning me over. Any closing thoughts, Justin? Just more of what you said. When I first heard the MSRP of these sets was $10.00, I was absolutely floored. There is NO WAY these are going to be that cheap…is there?? But indeed it’s true. Ten bucks gets you an awesome mid-scale vehicle and a new character figure, all in one awesome display box. It’s an incredible value. Like Fred, I do wish we at least got a battle stand of some sort, and even a gun, but I totally understand that the price might not have covered those extraneous items. The value of this set is simply amazing, and it really took me back in time. Do not hesitate, this is one vehicle and figure that you do not want to miss, I’m sure they’ll be going fast.